Peach invites Mario to the Star Festival, and on his way he meets a Luma who fell from the sky. As Mario arrives at Peach's castle, his arch-nemesis Bowser appears, grown to a giant size. He kidnaps the princess and escapes into space. You play as Mario as he travels across the universe on the Starship Mario, collecting Power Stars from different Galaxies. This time he is joined by Yoshi as well as a large selection of new power-ups. A second player can take control of the Co-Star Luma at any time to assist Mario. It can stun enemies, stop moving obstacles and collect Coins, Star Bits and other items. Several of the levels in Super Mario Galaxy 2 are remakes of levels from other 3D Mario games. Notably, the ones that show up in World S are some of the most challenging stages from their respective games. The Throwback Galaxy in World 6 is a recreation of Whomp's Fortress from Super Mario 64. The music is a remix of the "Bob-omb Battlefield" music (that also played in the original Whomp's Fortress), and Pink Bob-ombs appear to give you advice. After clearing the first Star, a Pink Bob-omb will appear on Starship Mario. The corners that you had to shoot off in Super Mario 64 to get a Power Star are missing, and one of the Pink Bob-ombs also says that Mario looks familiar, suggesting this is in fact the same location as the original stage. 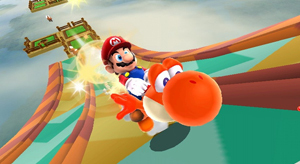 The Special World level, Mario Squared Galaxy, is loosely based on the "Mario Meets Mario" Star from the Toy Time Galaxy in Super Mario Galaxy. The stage is set on a giant Super Mario Bros. era sprite of little Mario. Also, as in Super Mario Galaxy, when you return for the Comet challenge, you play on the reverse of the planet: a sprite of little Luigi from Super Mario Bros. The Special World level, Twisty Trials Galaxy, is a recreation of the "Secret" Shine stage from Ricco Harbor in Super Mario Sunshine. The background is made up of classic Super Mario Bros. sprites. The Special World level, Stone Cyclone Galaxy, is a recreation of the same stage from Super Mario Galaxy. The Special World level, Rolling Coaster Galaxy, has been designed using rainbow coloured tiles reminiscent of Rainbow Road in Super Mario Kart. The first Star chapter is called "The Rainbow Road Roll" and the Purple Comet Star chapter is called "Rainbow Road Purple Coins".